above is the link to one of my new favorite songs (Never Beyond Repair-Everfound) It talks about how no matter what you do, no matter what the mistakes you’ve made, the promises you’ve broken, You are never beyond repair God will repair you and fix you. 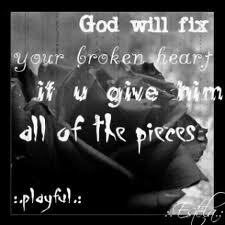 So no matter what you’ve done God will repair and God will fix you if you ask Him. This entry was posted in Uncategorized and tagged Everfound, God has time to fix you, Never beyond repair. Bookmark the permalink.